Artists Wendy Marvel and Mark Arnon Rosen create mechanical flip books. "Whenever we displayed our art, we were inundated with people requesting a kit version. In October 2012 we made it a reality. Teaming up with inventor / product designer Steven Goldstein, we created FlipBooKit. 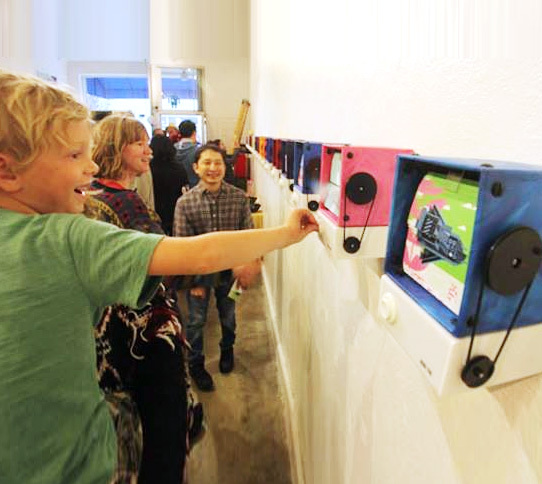 Packaged as an affordable DIY kit, FlipBooKit allows anyone to make either a manual or motorized flip book from a video or set of photos, creating a one-of-a-kind tactile kinetic art piece. Did you ever draw in the corners of a book to create an image that animated as you "flipped" through the pages? Or been to a penny arcade and hand cranked a machine to watch a movie thru a small opening? Build your own kit & make your own animation!